2014 British Indoor Cycle Speedway Champion Ricki Johnson is aiming high for the 2015 outdoor season after recently capturing his first senior indoor title at Ryton Sports Connexions in Ryton, Coventry. Johnson, a familiar figure at Coventry having toured with the club to Poland in August 2014, cast any doubts of potential title credentials aside as he stormed to victory in the senior title beating fierce midland rivals Lee Aris and Chris Timms in the process, just hours after picking up the under 19’s championship too. 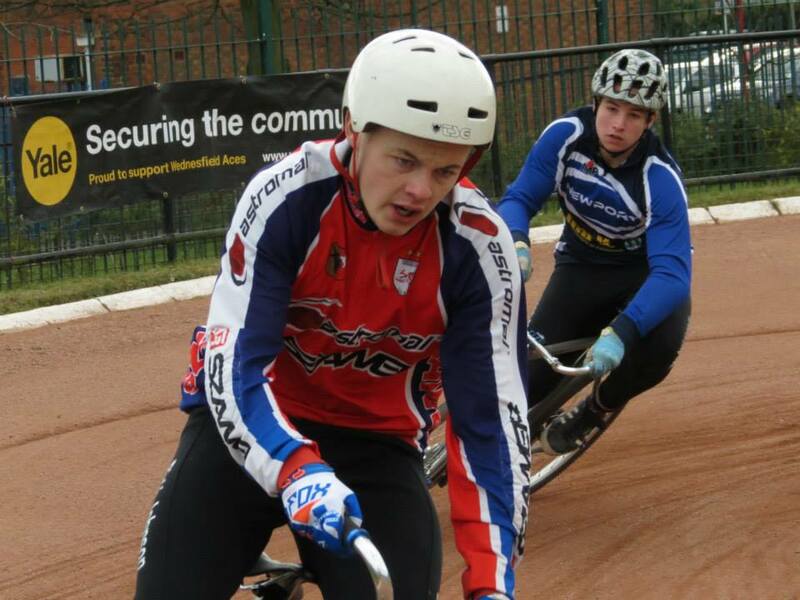 Speaking to Coventry Cycle Speedway press officer, Shaun Reynolds, Johnson reflected on a fruitful weekend of racing for the Birmingham based rider and looked forward to the upcoming season. Said Johnson, “Winning the under 19’s championships was my main aim of the weekend so it was nice to pick that up. “In all honesty I didn’t expect to win the senior title so it was a great moment when I crossed the line in my final race to win. I have to thank the Wednesfield team and their members for all the support they’ve given me since I’ve been racing with them. Johnson has also appeared to end all speculation regarding his possible move to Birmingham for this season “I’ve moved to Birmingham for the training element as it’s more practical,” Johnson added “It’s closer to my home and I’m going to train a lot harder this season to try and reach the world championship final. Coventry Cycle Speedway would like to thank Ricki for giving our club his time to be our first ‘tracker’ of 2015. Want to be a ‘tracker’ yourself? Get in touch!